This is the final entry in the Planck Launch Campaign journal series, which ran from February 2009 until just before launch in May 2009. The journal covered the main activities during the period leading up to launch: from the shipment of the spacecraft to the launch site in Kourou, to the final integration of the spacecraft with the launcher. This journal series followed the Planck Test Campaign journal series, which ran from September 2005 to November 2008 (see link in right-hand menu). 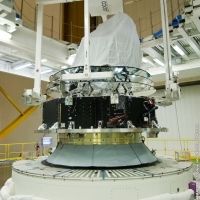 The Planck spacecraft has been mated with the Ariane 5 ECA launcher on 23 April 2009. After the successful fuelling of the Planck spacecraft in the S5A building a week earlier, the spacecraft was transferred to the final assembly building (Bâtiment d'Assemblage Final, or BAF) in the evening on 22 April. There it has been integrated on top of the launcher rocket that will place both the Planck and the Herschel spacecraft in their trajectories to L2. The BAF building is dedicated to final preparation of the launcher on the launch table, integration of the upper composite (SYLDA 5 support structure and fairing), and assembly of the upper composite on top of the launcher. The building is located about 10 km from the S5A building where the Planck fuelling operations were performed and about 2.6 km from the Ariane launch pad. Opening of the CCU3 container inside the BAF, 23 April 2009. On Wednesday 22 April, late in the evening, the Planck spacecraft arrived at the BAF airlock. After entering the airlock and ensuring cleanroom conditions inside, on the next morning the spacecraft was rolled out of the payload transport container (Conteneur Charge Utile 3, or CCU3) that was used to maintain a cleanroom environment during the transport from the S5A building. In parallel to the spacecraft preparation activities during the launch campaign, the lower part of the Ariane 5 ECA launcher has also been assembled and prepared. Now standing in the 90m-high hall of the BAF building it is comprised of the main cryogenic core stage (EPC) and the two solid propellant boosters on opposite sides of the EPC. On top of the EPC are the upper stage (ESCA) and finally the Vehicle Equipment Bay (VEB). A 0.78m-high adapter cone, composed of a strong carbon structure and two aluminium rings, is integrated over the VEB to interface between the launcher and the Planck spacecraft. The 47m-high BAF airlock is adjacent to the BAF's 90m-high hall where launchers are mated with their payload and are finalised. The airlock and the adjacent hall are connected by a wide shaft in the hall that at its base opens into the airlock. The Planck spacecraft is secured to the vertical lifting device (left) and the launcher adapter ring is disconnected from the CCU3 pallet (middle) after which the Planck spacecraft is hoisted up (right), 23 April 2009. 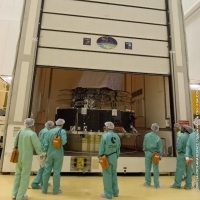 The Planck spacecraft is lifted up inside the BAF, 23 April 2009. In the morning on 23 April the Planck spacecraft was hoisted up inside the BAF airlock and through the shaft into the hall. With the launcher adapter ring (Adaptateur Charge Utile, or ACU) already integrated at the base of Planck's service module the spacecraft was lifted from the CCU3 pallet and hoisted up by an overhead crane, using the Planck vertical lifting device to handle the spacecraft. Inside the hall the spacecraft was manoeuvred over the Ariane launcher. It was then lowered in place and integrated with the launcher by personnel on the payload access platform (Plate-Forme Charge Utile, or PFCU), which surrounds the launcher at the height of the VEB. The ACU was bolted to the launcher's adapter cone that is secured on the VEB. The electrical connections between the launcher and the ACU were also set up and tested. In the high hall of the BAF, the Planck spacecraft is lowered into place on the launcher and the launcher adapter ring is integrated on the adapter cone over the VEB, 23 April 2009. Image on the right: Planck is mated with the launcher. 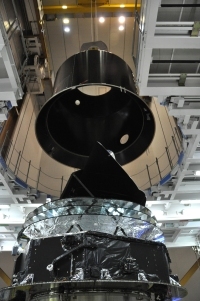 Final preparations were then performed on the Planck spacecraft before its encapsulation with the SYLDA 5 support structure that will carry the Herschel spacecraft during the joint launch. These preparations included the last finalisation of the multi-layer insulation, the removal of all non-flight items such as protective covers, and a final visual inspection of the spacecraft. The Planck spacecraft was also switched on for a final functional check after the mating with the launcher. The SYLDA 5 (Système de Lancement Double Ariane) is a support structure that can be used during joint launches on an Ariane 5 launcher to carry the upper part of the launcher's payload, the second spacecraft. It consists of a load bearing carbon structure that is comprised of a conical base fixed to the Vehicle Equipment Bay, a high cylindrical shell and an upper truncated conical shell. Lowering of the SYLDA 5 over the Planck spacecraft, 27 April 2009. Overhead view of the SYLDA 5 after encapsulation, 27 April 2009. On Monday 27 April the SYLDA 5 was hoisted up inside the BAF airlock and up into the 90m-high hall by a crane that subsequently lowered it into place over the Planck spacecraft at the top of the launcher. At its base the SYLDA 5 is almost as wide as the launcher, which has a diameter of 5.4 m, and it now encloses both the Planck spacecraft and the launcher adapter cone (between the launcher and the spacecraft) that is only 3.9 metres in diameter. The base of the SYLDA 5 is bolted to the VEB. After launch, at the required time, a pyrotechnical device running around the SYLDA 5 at the level of the conical/cylindrical lower interface will cut it in a horizontal plane. Immediately after, springs will impart an impulse to jettison the SYLDA 5 away from the spacecraft. After its installation on the Ariane 5 ECA launcher the SYLDA 5's electrical connections with the launcher were set up and verified. To maintain the Planck spacecraft's environment under the enclosing support structure a nitrogen flushing system has been connected to the SYLDA 5, providing dry nitrogen atmosphere to Planck. The next major milestone in the launch campaign will be the mating of the Herschel spacecraft on top of the SYLDA 5.